Thursday night brings over friends: Rich, Chuck, and Steve (in some order), allowing us to have a few quality American craft beers. While together we usually cover just about any and all topics. The obvious is the banter about the beers we are drinking but we do share stores about the families, work, play, and, yes, even politics. The part I like best: having an assortment of beers to choose from for my daily beer. Sometimes I have my mind made up before we start to only have it changed once we start testing and reviewing. On a night when I only have one beer, there is no going back. Espresso Oak Aged Yeti by Great Divide Brewing Company was the night cap of our beers and, for me, the best of the four beers we tasted. 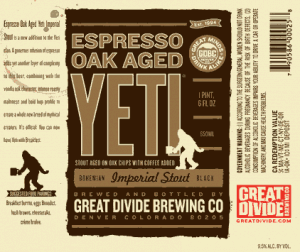 Lots of coffee and chocolate, both sweet and bitter, are present in this beer. The finish has such a complimentary combination of the two that it comes off creamy and delicious. A really solid beer. Enjoy! Useless Fact: Poet Henry Wadsworth Longfellow was the first American to have plumbing installed in his house, in 1840. I know I say this almost every time about Wednesday, but checking out the new American craft beers each week at the beer store is more intoxicating than the beer itself. This week there was an outstanding amount of new American craft beer that the excitement is rightly placed. free run 5.0 femmes I was under strict instructions from the boss (aka wife) not to purchase beer since I bought 18 bombers on Saturday through my cousin in California). I scrambled and looked in my wallet, by some act unbeknownest to me, I actually had cash. Several months ago when I was on a Wednesday visit a man ask if I had any suggestions for beer and that he liked hoppy beers. Modus Hoperandi by Ska was what I pointed him to. He was actually back at the store yesterday and asked for my help in getting some beers again. I hope he will be satisfied with the selection and it sort of nice for someone to seek out my opinion on beer. Enjoy!